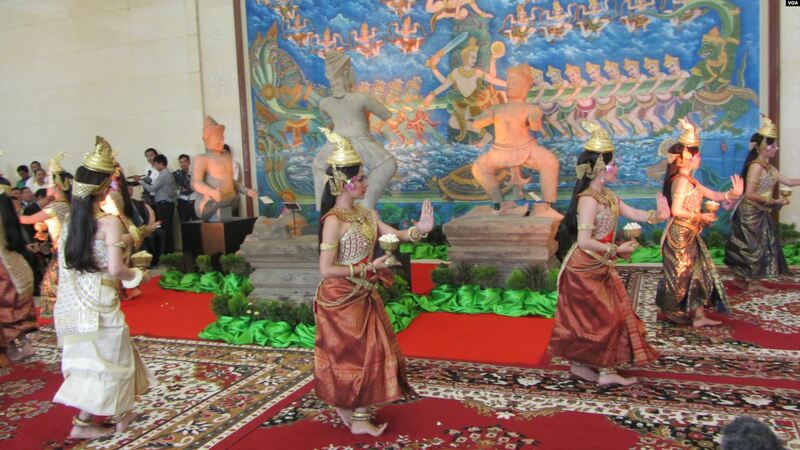 Statues returned from U.S. are welcomed in a ceremony attended by Prime Minister Hun Sen, June 3, 2014, Voice of America photo. 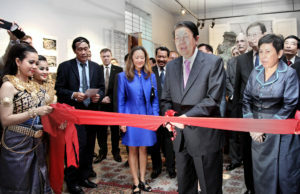 Cambodia is seeking a renewal of a US Memorandum of Understanding (MOU) to embargo import of all artifacts. A Cambodian MOU has been in place, and ever-expanding in scope, since 1999. The request will be considered by the Cultural Property Advisory Committee, meeting at the Department of State on October 23-24. All comments from the public must be submitted in writing by October 15, 2017. Use http://www.regulations.gov, enter the docket [DOS-2017-0036] and follow the prompts to submit comments. The first Cambodian ban took effect on December 2, 1999, when the U.S. imposed an emergency import restriction on Khmer stone sculpture and architectural elements from Cambodia, unless such objects were accompanied by export permits issued by the Government of the Kingdom of Cambodia, or by documentation demonstrating that they were out of the country before December 2, 1999. In 2003, the U.S. and Cambodia entered into a bilateral agreement, or Memorandum of Understanding (MOU), covering the same materials. In 2008, the Cambodian MOU was expanded to cover all objects dating from the Bronze Age to the end of the Khmer Empire, which was extended again in September 2013. A Designated List of items that can no longer enter the US was published by the Department of Homeland Security on September 19, 2008 and remains effective today. H.E. Sok An, Deputy Prime Minister and Minister in Charge of the Office of the Council of Ministers cuts the ribbon to open the exhibition showcasing the grouping of nine pedestals and five statues from Prasat Chen at Koh Ker. U.S. Embassy photo. At this date, renewal of the almost 20-year old ban under the Cultural Property Implementation Act would be a purely symbolic act. The world’s sympathies are with Cambodia, recognizing what its people – and its cultural heritage – suffered through the brutal totalitarian regime of the Khmer Rouge. Cambodian museums and cultural authorities can expect to be dealt with fairly and generously by US collectors and institutions, and Cambodia has nothing to fear from them. The proposed renewed MOU is unnecessary in part because in 1993, Cambodia issued a decision on the National Heritage Protection Authority of Cambodia, and in 1996, Cambodia passed the Law on the Protection of Cultural Heritage (LPCH), which outlines the limited property rights applicable to cultural property. The law severely restrict an owner’s property rights if an object is classified as an artifact by the government. Importing objects taken from Cambodia since that date is a potential violation of a US criminal law with harsh penalties, the National Stolen Property Act (NSPA). An aggressive prosecution of individuals who broke other US laws either importing or selling ancient Thai and Cambodian artifacts has already sent an elderly art dealer to prison in the US. Aside from the stringent legal penalties for illegal trade under the NSPA, the voluntary return by US museums of any suspect Cambodian artifacts is a major disincentive to collecting any item without a lengthy and secure provenance. 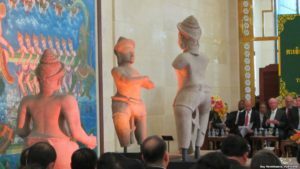 June 2013, opening ceremony of the 37th session of the World Heritage Committee in Cambodia with return of two statues (known as the Pandava Brothers – Sahadeva & Nukula) by the Metropolitan Museum of Art in New York. Shown, Prime Minister Samdech Techo Hun Sen and Irina Bokova. 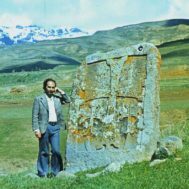 Source Unesco. Sculptures taken from the remote Prasat Chen complex in the Cambodian jungle have been a particular focus of Cambodian repatriation efforts after a long, drawn-out legal battle between US prosecutors and Sotheby’s that ended in an agreement to return a sculpture known as the Duryodhana in 2013 (which had been out of Cambodia since at least the 1970s, but which had recently been identified as coming from a specific, though little-known site). The Norton Simon Museum and Christie’s returned sculptures around the same time. The Metropolitan Museum in New York voluntarily returned two statues in 2013. In 2015, the Cleveland Museum sent Cambodia a Hanuman figure from the same complex. The last Prasat Chen sculpture known in the US was returned to Cambodia by the Denver Museum in 2016. The vast majority of items in US museums are donated by collectors; in the US, museum donation is the ultimate collectors’ goal. 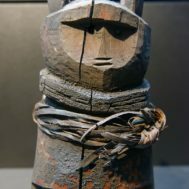 Given a climate favoring returns to Cambodia, the only acquisitions of interest to museums, or to the collectors that supply them, are artifacts that can be shown to have left Cambodia long ago – prior to CPIA-based MOUs and prior to passage of Cambodia’s patrimony laws – and that also have no ties to a specific site. 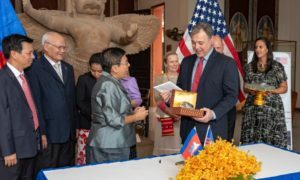 US museums have already gone far beyond the requirements of the law and voluntarily returned many large sculptures and important artifacts to Cambodia. Three Statues repatriated in Phnom Penh ceremony. June 3, 2014. Photo Voice of America. If it is renewed, the US-Cambodian MOU will be undertaken for political reasons, and to advance an agenda of perpetually expanding, never-ending art trade embargoes embraced by officials at the Department of State’s Bureau of Education and Cultural Affairs. (See: Obama Administration Packs CPAC Membership to Lock In Anti-Collecting Bias, February 5, 2017.) This is because, as a matter of law, the Cambodian request for renewal does not meet the criteria required under the Cultural Property Implementation Act. To take just one example of a requirement that cannot be met, there is no substantial benefit to Cambodia by halting the US market in recently looted objects – first of all because there is no US market for recently looted objects. Secondly, stopping trade to the US will not affect the market – such as it is – for looted objects, because the primary market for Cambodian artifacts is not the US – it is Thailand. For the most part ignoring a Thai agreement with Cambodia, collectors in Thailand, who range from industrialists to high-ranking military and politicians, remain the most active buyers of Cambodian art. Thai culture does not acknowledge that the border between the two countries has any meaning in terms of heritage. Cambodian heritage is Khmer heritage, as far as they are concerned, and it belongs to the Thais as much, or more, than it does to Cambodia. These Thai collectors, who are often high military, and the far smaller foreign markets are supplied by Cambodian networks operated and protected by high Cambodian officials and the military. Cambodian museums and cultural officials cannot stand up to much more powerful government interests. Cambodia fails the test of protecting its own cultural property. U.S. Ambassador Hedit and Cambodian officials celebrate renewed cultural property agreement. U.S. Embassy photo. In addition to a policy bias against the trade in art at the Bureau of Education and Cultural Affairs, the Department of State also uses art agreements as a political tool and a quid-pro-quo to achieve unrelated (and higher priority) diplomatic goals: to mark a Presidential visit, or for cooperation in interdiction of guns or drugs. It is wrong to use art as a diplomatic Band-Aid, and it demeans the law, but it happens. The recent political news from Cambodia is all bad: Prime Minister Hun Sen, who has run Cambodia for 32 years, is clamping down on freedom of expression, freedom of assembly, and freedom of speech. Commentators say that Hun Sen is looking more to China, which has given Cambodia $500 million in loans, rather than the US, which provides a mere $35 million in aid. Renewing the US ban is not only unnecessary for Cambodian heritage preservation – it would serve as a gratuitous benefit to the most repressive elements of the Cambodian government. Riot police officers stop journalists from entering a blocked main street near the Cambodia National Rescue Party (CNRP) headquarters, on the outskirts of Phnom Penh, Cambodia, Monday, May 30, 2016. Voice of America photo. 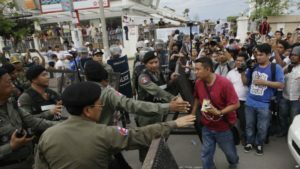 Cambodia’s democracy is at serious risk. 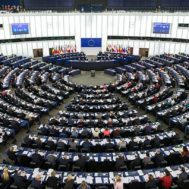 Hun Sen’s ruling party is undermining Cambodia’s democratic gains by attacking anyone threatening its power, silencing rival politicians Kem Sokha and Sam Rainsy, imprisoning journalists and human rights lawyers, and shutting down the non-government press and NGOs, such as the National Democratic Institute, a US-funded nongovernmental organization. The owners of the English language Cambodia Daily, a highly respected independent newspaper, were hit with a multi-million dollar tax bill, created by the government without an audit, in August, and have closed down. Other news organizations are closing and journalists, including foreign journalists, are fearful for themselves and their families. How do concerns for Cambodian democracy relate to cultural property issues? Hun Sen, like other totalitarian heads of government around the world, has ‘played the cultural property card’ to clean up his negative international image and bolster his his domestic popularity. Hun Sen is believed to be one of the most corrupt and self-enriching leaders of the most corrupt country in Southeast Asia. Hun Sen has made the return of Cambodian statues a key element in his international relations, making very public obeisances and participating in flamboyant ceremonies for each repatriation. When the two statues returned by the Metropolitan Museum arrived in Phnom Penh in 2013 (an election year), they were displayed – not in a museum or at their original site – but at the entrance to his offices at the Peace Palace. This policy raises serious questions whether an anti-democratic leader who condones political imprisonment on false charges, denies press freedom, and describes American democracy as “bloody and brutal,” should be allowed to use US-Cambodia agreements on art or the voluntary returns of US museums to enhance his political prestige. If the State Department wants to send a signal to Cambodia’s current leaders to back off from human rights abuses, and to stop the false accusations against the free press, then the US can consider the most recent 2016 Cambodia 2016 Human Rights Report, and refuse to do Hun Sen another political favor – by rejecting the proposed renewal of the Cambodian MOU in October 2017.